Versatile, flattering, cozy and chic. I can’t say enough about this Japanese traditional garment that’s making a comeback. In fact, it’s become a staple of almost every well-known fast fashion chain. Yet, what do most people really know about this garment’s history? This piece, which has so many distinctive features (form, motif, design, fabric and accessories), has an amazing story behind it. The Japanese, following their normal tendency to adopt, adapt, adept, started wearing the orient fashion in the eighth century. Traditionally, they were made from a single fabric bolt. By the 20th century, most Japanese citizens wore Western clothing. Today, kimono manufacturing is on the edge of crisis. Reduction of the kimono market, and the aging of artisans, and lack of their successors are slowly diminishing the once vibrant art. 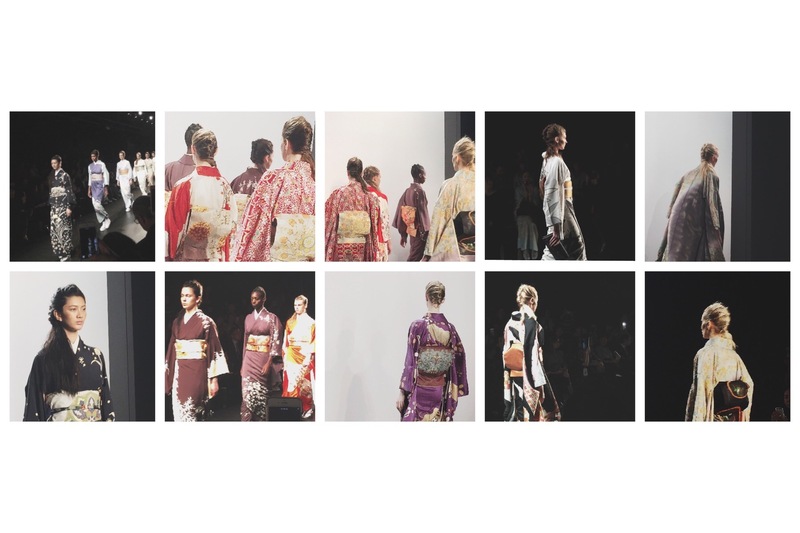 Hiromi Asai, whose collection “Spirit Of The Earth” captivated me during NYFW, and my genuine curiosity for Japanese culture, inspires me to incorporate the traditional kimono into my wardrobe. Just like the little black dress or white shirt, I believe this should become a staple for all women. Hiromi Asai’s silk kimonos were a breath of fresh air at NYFW. I particularly loved the ones that featured pastel colors and minimal prints. The robe-like, relaxed look was absolutely stunning. I discovered Suenaga Browne’s stylish handbags online and I knew I had to talk to her. This was a great opportunity. I’ve always admired the natural simplicity and philosophy of Japanese aesthetics. I find this particular designer’s fusion of traditional Japanese and Western cultures quite interesting. Tell me more about the function of your products. The name “Hakobu” comes from the Japanese word “hakobu” or “to carry.” I chose that name because I wanted to make products that people could easily carry with them whenever they left the house. I want people to look and feel stylish with products that are well-designed and easy to use during their daily routines or when they go somewhere special. Hakobu designs bring together elements from Tokyo, Japan, where I grew up, as well as elements from the US. Combining these elements, I focus on creating unique designs that have a friendly, familiar feel to them. I create designs that are sophisticated and Japanese in their simplicity. And I think one of the true charms of Hakobu is that all of our products are handmade and unique. Each is made only once. That allows our customers the joy of having a one-of-a-kind item, something truly personal they can add to their look. My creative process for Hakobu involves several steps. hakobuFirst, in order to design a sewing pattern for a product, I do research and gather lots of information. Hakobu designs involve adding American and European elements to Japanese elements, as well as adding contemporary elements to traditional elements. I therefore spend time researching Japanese and Western traditions and fashions, both online and on paper, to bring those four areas together. For example, my Azuma bag is a contemporary approach to a way of carrying goods that was used in the Edo period in Japan. And my Hakobu bag is a contemporary approach to kinchaku drawstring bags that were used for personal items also during the Edo period; this I have made into a true handbag. Both meant designing original patterns. And I have altered both types of bags to make them contemporary and easier to use. I have added magnetic snaps, changed sizes and combined Japanese and Western fabrics. Most Hakobu products are based on traditional Japanese items, while the fabric patterns combine both Japanese and Western elements. When I select fabrics, I look for different characteristics. When selecting Japanese fabrics, I look for those that are reminiscent of traditional designs and those that convey a sense of the four seasons and Japanese culture. When selecting Western fabrics, I look for things that inspire me, things that remind me of American television shows I watched as a kid, movies, European art and places I have visited. Bringing Japanese, Western, traditional and contemporary elements together, ideas tend to come to me when looking at fabrics. With the shapes decided, I go from there and create each Hakobu product. This is something that is intuitive and therefore hard to describe… but in the end, Hakobu products represent my personal experiences. I have not, though I have been dancing since I was a student! I used to do cheerleading, and I have also learned hula. The question reminds me of the film “Singing in the Rain.” Dancing so smoothly and singing “I am dancing and singing in the rain….” I really like that scene. What is your perfect breakfast? I love the breakfasts you get at Japanese hot spring ryokan (hotels). Rice, grilled fish, miso soup, seaweed, and Japanese omelets. This is a traditional breakfast in Japan that is so simple and so good. But honestly, usually I do not have time, so my breakfast is often just coffee and toast. I tend to be rather straightforward, and rarely am I embarrassed or feel the need to hide anything, so no question really bothers me. I don’t like attacking, negative questions, though. In general, Japanese people are said to be quiet and shy. But personally, I do not think that’s quite accurate. I think that Japanese people tend to say their opinions when appropriate, but also resist being self-assertive when it is not appropriate. “Roman Holiday.” I feel really drawn to Audrey Hepburn’s character (Princess Ann), who is so beautiful, yet playful and unpretentious. This character embodies the kind of women I admire. As this is an old romantic comedy, this movie does not have the sexual elements of contemporary movies. This, together with the beautiful streets of Rome, the fashions and expressions of characters, and how it is filmed makes for a beautiful movie. Watching it puts me in a really good mood. I will never get tired of it. That would be “You should open your own store.” My husband, who did something similar with his own artwork, encouraged me to start. Starting the Hakobu brand was a big decision and required a lot of energy. I had plenty of questions early on: “what kinds of things do people like? ;” “how can I explain my products simply so people understand?” etc. I had doubts, too: “Will people buy this?” When I opened Hakobu, it took time before the first product sold, and I felt quite a lot of frustration. But my husband encouraged me to look at it long-term — “make good products and people will come.” And my family and friends have always been there, supporting and cheering me on. I have made it this far because of them. Having started this brand, it has connected me with websites like this one, with people on social media and has allowed me to see things and meet people I never knew before. I am really glad I decided to take that first step and start. I want to thank Lena for this opportunity. Truly, thank you!